US Soccer Federation “Coach and Player Development Plan”, Dutch Federation KNVB Player Development theory and practice, AFC Ajax of Netherlands methodology, AFC Fiorentina of Italy methodology, GNK Dinamo Zagreb of Croatia methodology, S.L. Benfica of Portugal methodology, Santos FC of Brazil and FC Barcelona theory and practice clinic. Haris Obic was born and raised in Velika Kladusa, Bosnia and Herzegovina. He moved to San Francisco in 1997 as a war refugee and today resides in Walnut Creek, CA. His soccer playing career began by playing in the pioneer (youth) ranks of N.K. Krajisnik. He used soccer as a coping mechanism to alleviate stress during the war. Upon arriving in the USA soccer was tool he used to integrate into a new culture through advocating positive vision, values and relationship building. 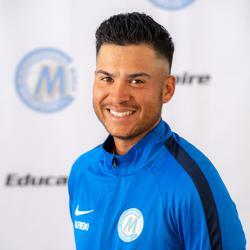 Haris attended Holy Names University in Oakland Hills on an athletic scholarship where as a part of the men’s soccer team they won four Cal Pac championships and earned four NAIA national tournament appearances. Haris is professionally driven to succeed as a coach and ambassador of the game both locally and worldwide. His passions include community building, teaching youngsters character building and the skills necessary to become dynamic leaders. He enjoys building teams who possess a lifelong passion for the game of soccer and who compete with a zest for excellence and peak performance on and off the field. Although he is committed to coaching modern possession (indirect build up soccer) as a part of a team strategy, he is equally committed to patient individual player development. At an individual level, Haris strives to promote the joy of playing with the ball (creativity and technical proficiency), player driven decision making (high game intelligence and perception) and play through principles of play rather than any one system (allowing players to adapt and play within any system they take part in). US Soccer Federation “Coach and Player Development Plan”, Dutch Federation KNVB player development theory and practice clinic, AFC Fiorentina of Italy method Basic Course, GNK Dinamo Zagreb of Croatia. Antonio “Tony” Neto was born and raised in Joao Pessoa, PB, Brazil. From an early age he found soccer as primary means of entertainment and aspiration. He moved to San Francisco, CA in 2001. Adapting to the new culture and lifestyle was made easier through the game of soccer. 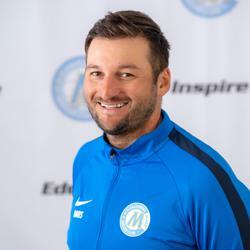 Through competitive and pick up games in Northern California he developed a relationship with Jasko Begovic who introduced him to coaching at youth and High School levels. 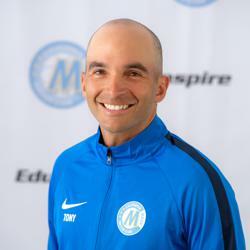 Tony is driven to build a coaching career on the foundation of passion, creativity, and unconditional love of soccer which he experienced growing up in Brazil. He believes the soccer ball is the ultimate toy in the world. As a youth coach Tony strives to instill character values of hard work, respect, dedication and excellence to every individual and team he coaches. Ramon Zambrano was born in Mexico and moved to Richmond, California when he was 8 years old. Ramon spent most of his time playing unstructured soccer and pick up with his siblings, neighbors, and friends. He began playing structured and team soccer when he was introduced to The Boys & Girls Club. Ramon began playing with the ACC Mavericks from Berkeley, and was given the opportunity to play for competitive leagues and tournaments. He competed in the San Diego Surf Cup, the Schwan's USA Cup in Minnesota, and numerous tournaments throughout California, Nevada, Oregon, Washington and Arizona. 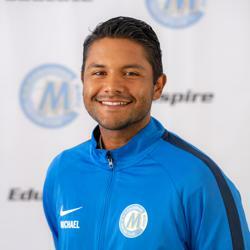 In addition to his participation in competitive leagues, Ramon was a stand-out soccer player for Richmond High School’s Varsity Soccer Team during his four years as a student. 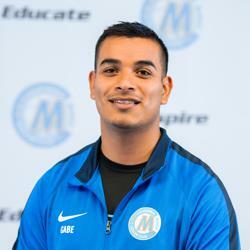 Upon graduating, Ramon's passion for soccer continued and he began playing for San Francisco Premiered League, one of the most competitive adult leagues in the East Bay. After playing for five years for the San Francisco Premiered League, Ramon discovered his passion for leadership on and off the field. 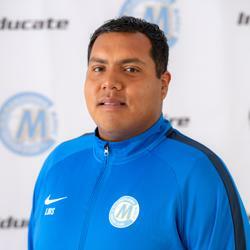 Ramon began his coaching career with Richmond High School as an assistant coach for the JV team, and eventually moving on to coach the varsity team. 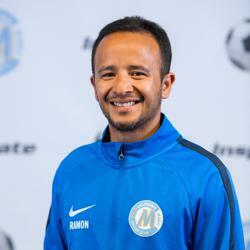 Soon after, Ramon was offered the opportunity to coach youth soccer at the club level where he gained two years of experience. Ramon was thrilled to find out about Magic and their philosophy and decided to jump on board as a coach. 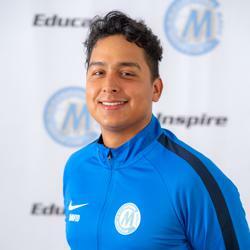 Ramon hopes to share his experience, knowledge, and most importantly his passion for soccer with his teams and fellow coaching staff. 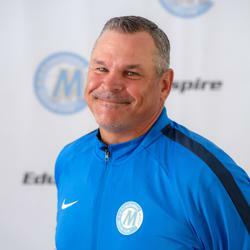 The birth of his son further increased his desire to become involved in coaching so he can help instill in him the love and passion for soccer, and the work ethic, camaraderie, and values that the game of soccer has bestowed upon him. Fun Fact: Ramon's son Noah can often be seen watching and enjoying the games with his mother or kicking balls around on the field. Roberto "Beto" Zambrano was raised in Richmond, California in a soccer family. He started playing with the ACCYSL Mavericks in the Richmond/Berkeley area and played on the Richmond High Varsity team for 4 years. Beto played one year at Contra Costa College and seven years in the San Francisco Soccer Futbol League and California Premier Soccer Association. Beto started coaching career right out of High Schools the Assistant Varsity and JV Head Coach at Richmond High . He continues to influence youth in his area as Head Coach the Richmond High Boys Soccer Team, one of the perennial powers in the North Coast Section/CIF. After meeting Jasko and Haris, Beto began coaching soccer at the club level and joined California Magic in 2013. I believe that soccer lives in the tension between the individual and the team. At the younger ages, focus should be put on the development of the player, while when the children mature and master their skill set, team building should be emphasized. ​"I strongly believe in giving the younger player the technical tools he/she will need sooner or later to express himself in the framework of the team. I believe this learning must take place in both structured and un-structured environments. I encourage my players to play games that are related to soccer, but are not soccer, such as futsal, indoor soccer or beach soccer." Alfredo grew up in Los Angeles and moved to Pleasanton in 8th grade. He played BUSC Mustang and played in Honduras. He has been with Magic since 2013. He gives a different perspective to his players and embraces the process of learning. He believes in his players and supports all their goals and dreams. Alfredo is a believer and lives for turning the non-believers into believers. He grew up in Los Angeles, CA moved to Pleasanton in 8th grade. The game broke his heart several times but he enjoyed how much fun it was, the ability to connect and make friends with a ball, and how it will challenge and push you to the limit. Alfred enjoys spending time with family and friends and learning. He loves personal development and finding ways to improve and become the best version of himself. "I have big dreams and believe we all should. It starts with a vision. Without a vision, we have no real direction. Whatever the mind can believe the mind can achieve." David was born in Oakland California and has lived in the bay Area the majority of his life. From a very early age he fell in love with this beautiful game. He spent his youth playing on the streets with friends and cousin (Coach Mike). His father was always supportive and took David to all his trainings and games. He began organized soccer with small local teams. At teh age of 13, he began playing for larger clubs in Santa Clara and Mustang, spending summers in Mexico training. After high school he moved to Mexico to pursue his dream to play soccer professional. He player 3rd and 2nd division for Zacatepec Club. He played college soccer at Chabot Community College. This game taught him life long values and discipline that he still believes in and are part of his life. When not on the pitch, David enjoys music, hiking, traveling, nature, and barbecuing with with friends and family. "I want to be a role model to my players and be someone they can always depend on in their lives and on the pitch. I want them to know that I pushed them to their absolute max every training session, but most importantly I want them to say that they love the game because of their Magic experience. It's much more than a game, it's a lifestyle." Mike was born and raised in Oakland, California. He started playing in the streets, parks and back yards as a kid with his cousin David who also is a coach here at Cal Magic. Mike played club soccer all around the Bay area and in Southern California for Chivas USA which was participating in the MLS at that time. Got an opportunity to play in various professional club teams in Mexico including First Division with Queretaro FC. Was blessed to represent his National Team of Mexico u20 and u21 on numerous occasions and compete in some of the worlds top private tournaments. During his playing time, he was also able to play in the MLS for Chicago Fire back in 2010-2011 season. Coach Mike is 100% Vegan who enjoys traveling, learning from others, reading, eating good food, meditating and playing pick up soccer. "Futbol is a way of living - it is holistic in that it is mind, body, and spirit cleansing. Starting to coach was the start of healing for me and the beginning of full living". Michael's goal is to develop the player’s potential by expecting excellence and then doing everything possible to provide a positive, passionate, and complete environment for them to learn. He loves soccer and refers to it as "the beautiful game" for a reason. He hopes to share the life lessons it teaches with his players: excellence, teamwork, maximum and sustained effort, hustle, creativity, class, and sportsmanship. Additionally, he is an adherent of the coaching philosophy developed by the legendary UCLA basketball coach John Wooden. Specifically, he believes in teaching his players to be leaders as defined by his pyramid of excellence. "The coaching relationship I form with all my players (and their parents) is based on three pillars: mutual trust, mutual respect, and authority. I want all the players on my teams to know that I am fully committed to develop them as soccer players and as human beings -- to the best of my ability. They should be able to trust that I care for them in every fiber of their being." Graduated from Pajaro Valley High School. Mercy College (New York) Bachelors in Criminal Justice. Gabe was born in Santa Cruz. He grew up playing soccer at the Santa Cruz Breakers Academy. He competed with the Cal-North ODP and Refion IV ODP. Gabe continue his playing career at Mercy College. Gabe enjoys the tactical aspect of the game. He is always looking to figure out what next pieces to tweek or change in order to make things work. The most rewarding aspect of coaching for Gabe is watching his players’ growth throughout the years. When Gabe is not on the pitch he is teaching high school. His favorite thing to do in the off season is to travel. Luis grew up in Peru and came to the US in 1997. He grew up playing street soccer, which helped him develop a speed of play. By playing against older kids and playing on the street he developed toughness and unbelievable sense of balance. In his youth, Luis played for HYSL, Varsity at Hayward High School, and Chabot College. Luis is drawn to soccer because of its universal language and ability to bring people together. He strives to not only develop his players tactically but to by a role model for his players. When he’s not on the pitch, he loves spending time with his son, Luisito! Observational and educational visits with Bayer Leverkusen and FC Koln of Germany, Ajax Amsterdam and AZ Alkmaar of Netherlands, Dutch Federation KNVB, German Federation DFB Henns-Weisweiler Academy, and Colorado Rapids YSC and Development Academy. 2019 and 2016 La Liga Formation Methodology and Player Development model. Guest trainer Colorado Rapids YSC and Ilves Ry-Jalkapallo of Finland. Jack Rozier was born in Takoma Park, Maryland and raised in Lugoff, South Carolina. He moved to Berkeley in 2010 and today resides in Oakland, CA. Jack’s soccer playing career began at age six in the youth recreational leagues of Kershaw County. As a youth player he earned team and all-region honors. He continues to this day in pick-up games and Bay Area adult leagues. Soccer has provided an opportunity in Jack’s life to develop leadership skills as a mental health counselor, elementary school teacher, coach, and soccer club administrator. As well, soccer is a vehicle that has opened doors to learning, friends, and travel around the world. Soccer has provided an opportunity in Jack’s life to develop leadership skills as a mental health counselor, elementary school teacher, coach, and soccer club administrator. As well, soccer is a vehicle that has opened doors to learning, friends, and travel around the world. Off the pitch Jack enjoys reading, writing, and traveling, all of which have often gone hand-in-hand with soccer. Recent travels include bike touring in Spain and carnival in New Orleans. "I love developing my coaching craft as a constant exploration of learning, relationship, communication, and community"
Dutch Federation KNVB developmental method clinic, AFC Fiorentina of Italy method, GNK Dinamo Zagreb of Croatia, S.L. Benfica of Portugal. Jasko Begovic was born in Teslic, Bosnia and spent his formative years from 1980-1992 there. Because of war and political unrest, he spent his teen years from 1992-1997 in Germany as a refugee. Still a refugee at 17, he moved to the United States in 1997. He attended Berkeley High School and fulfilled undergraduate studies at Berkeley City College and Contra Costa College. Today, Jasko lives happily in North Berkeley. Jasko's passion for soccer sparked while he was a young boy watching older neighborhood kids joyously playing on pavement and crowded street corners. There kids developed character and personality naturally via the universal culture and order of street soccer. They were freely playing the most beautiful game in the world. Even as a 10-year old, Jasko was demanding of his teammates who did not yet view the game as a culmination of individual skill and group tactics. He had an affinity to study the game and orchestrate within it. As a 12-year old living in Germany, Jasko was invited to play for a formal club called called S.V. Ravensburg and then T.S.V. Burgau where he was introduced to structure, discipline and conceptual play. Jasko and his mother moved frequently while in Germany and he was constantly adapting to new communities. He played for various clubs including S.S.V. Ulm where he formally played basketball as well as soccer. This required a 1.5 hour train ride from Burgau to Ulm and back, three times per week ... and he did not always have the proper fare. Jasko had to adopt many aspects of German mentality and its unique cultural approach to soccer. Strict German work ethic and persistence deeply influenced him as a person and athlete, and still does today as a teacher-coach. Those values resonated with his innate sense of demand for excellence from himself and others. This could be perceived as an early affinity for coaching because even as a youngster, he interacted with coaches and studied the game. Possessed of strong personality, he could become frustrated at times but also because of his open-mindedness, he was not too shy to ask coaches for explanation or elaboration - and he could accept learning from a good coach. 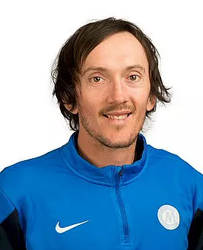 Jasko began his professional coaching career in 2007 and formalized his approach to player and team development though dedication and open exploration of various world standard methodologies. Besides working diligently on his vision for California Magic, he continues as Trainer/Co-Head Coach for Richmond High School. Jasko is demanding and specific as a coach but also wants his players to enjoy themselves while making the game their own experience. His professional attitude balanced with developing good people makes him an invaluable coach. "Artistic expression and a magical feeling while dribbling, passing and shooting is my personal way of experiencing soccer. I believe that my relationship with the ball is personal like a musician's relationship with an instrument. And the musician collaborates with others to create an orchestration, a soccer player collaborates with teammates to create team play bigger than oneself. My primary objective as a coach is to transfer this feeling to my players. Through all transitions in my life, both the game of soccer and my art became universal languages allowing me to connect with people anywhere. Soccer transported me. By losing myself in the beautiful game, I was beamed up or away from my harsh reality as a war kid. I respect the game deeply as something that saved my life and I pay the game back every moment that I coach."